These observations indicate that the World Trade Center steel was subjected to very high temperatures. Yet, while postulating that the towers collapsed due to fire (and without the use of explosives), even Thomas Eagar--an engineering professor at the Massachusetts Institute of Technology--admitted, "The temperature of the fire at the WTC was not unusual, and it was most definitely not capable of melting steel." One must conclude that the phenomena observed by Astaneh-Asl are therefore highly suspicious. Kenneth Chang, "Scarred Steel Holds Clues, and Remedies." New York Times, October 2, 2001; Robert Sanders, "Report from Ground Zero." Berkeleyan, October 3, 2001; Jeffrey R. Young, "Scholars Work to Rebuild the World Trade Center Virtually." Chronicle of Higher Education, December 7, 2001. Keay Davidson, "Berkeley Professor Seeks the Safer Skyscraper." San Francisco Chronicle, October 22, 2001. Robert Sanders, "Report from Ground Zero." Jeffrey R. Young, "Scholars Work to Rebuild the World Trade Center Virtually." Keay Davidson, "Berkeley Professor Seeks the Safer Skyscraper." "Collapse of Overpass in California Becomes Lesson in Construction." NewsHour, PBS, May 10, 2007. 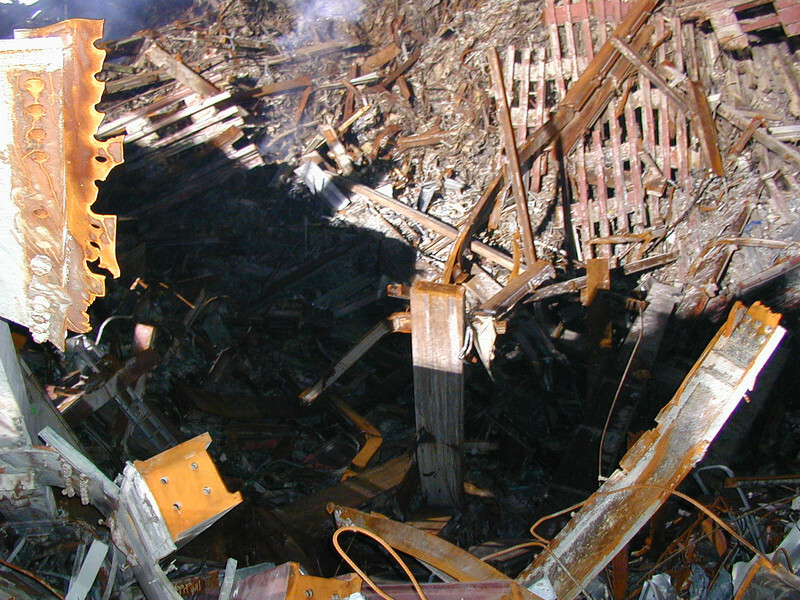 Pamitha Reynolds, "Berkeley Prof Analyzes Structural Damage of the WTC." Berkeley Daily Planet, October 20, 2001. David Kohn, "Culling Through Mangled Steel." CBS News, March 12, 2002. Kenneth Chang, "Scarred Steel Holds Clues, and Remedies." Thomas W. Eagar and Christopher Musso, "Why Did the World Trade Center Collapse? Science, Engineering, and Speculation." Journal of the Minerals, Metals, and Materials Society 53 (12) 2001: 8-11. David Kohn, "Culling Through Mangled Steel." Thank you for bringing this to our attention and especially thanks for the effort you put into your summary and the hyyperlinks. This is very valuable stuff. Have you forwarded this to ae911truth or patriotsquestion? peakdavid on Mon, 02/25/2008 - 3:42pm. No, but hopefully they visit 911Blogger, so will see these quotes here. Shoestring on Mon, 02/25/2008 - 3:58pm. Learning Channel a 9/11 Truth resource? The main text read well to me, but those 2 clips seemed ambiguous at best. My memory varies some these days, but I thought the Learning Channel had long been identified as a disinformation source. "But when the planes penetrated the buildings, they injected tens of thousands of gallons of extremely flammable jet fuel into each tower. "You just brought in very carefully a large amount of fuel, completely," he says. "Then let’s ignite it." Lucid on Tue, 02/26/2008 - 10:48am. And Astaneh-Asl should know that. Does anyone have his contact information? Vesa on Mon, 02/25/2008 - 5:32pm. No, but incendiaries like thermate/thermite do. Colombo on Mon, 02/25/2008 - 11:23pm. Shoestring, good piece, but did you catch this source? "The professor at the University of California at Berkeley said preliminary evidence indicates the structures withstood the impacts of the planes. Astaneh-Asl drew that conclusion after coming across clues like a steel support 1.5 inches thick from around the elevator shaft in the center of one of the towers. A semi-circular chunk of the support is gone. "It looks like a big bullet passed through here," he said. Judging by the curve of the chunk, that bullet, he said, was most likely the nose of a Boeing 767. Despite the fact that 40 percent of the steel beam was torn away, the column did not collapse, an example of redundancy built into the 1970s-vintage structure. "The impact did nothing to this building," he said with admiration." Arabesque on Mon, 02/25/2008 - 6:29pm. that had been certified by UL Laboratories. This steel was subjected to 2000 degree F. blast testing for 3 hours without losing structural integrity (strength), so how could 1 hour jet fuel fires with a max. burning temp. of 1795 F. account for these anomalies? THEY CAN'T. Again, even if ALL fireproofing was knocked off-- which is a preposterous assumption on a 110 story building, and even if the fires were burning at maximum temp.-- which even Eagar isn't saying, it still would not have mattered. Question: When Chief Palmer said there were "2 isolated pockets of fire" and they needed "2 lines to knock them down," did that mean that there were 2 isolated pockets of fire burning in the entire S. Tower (as "911 Mysteries" implies) or merely on that floor? I thought that it was for the entire building, but someone challenged me on that point, saying it was just for HIS floor. Are there similar radio communications from other firemen reporting fires blazing on various other floors of the S. Tower? RL McGee on Mon, 02/25/2008 - 6:12pm. I think the 78th was the first floor that he reached that had an active fire. There is no indication that he got past that floor. However, fires were visible from the outside, on other floors above the 78th. DoYouEverWonder on Mon, 02/25/2008 - 7:16pm. Colombo on Mon, 02/25/2008 - 11:33pm. What happened to the ripped spandrel plate on the left side of the picture? Sure looks like what they are describing? DoYouEverWonder on Mon, 02/25/2008 - 6:30pm. GeorgeWashington on Mon, 02/25/2008 - 7:02pm. Boiling point is necessary to vaporize lead? 1Sorry I should have questioned in the relevant thread, and not too late. What I'd like to know (as a non-expert) is whether the boiling point (1740 °C) is necessary for lead to vaporize, or as cited from the RJ Lee report, to volatilize, oxidize, and condense on the surface of the mineral wool. I suppose not only lead but (most) materials (eg. water) vaporize at temeratures well below their boiling points, and I've found a report about metal recovery from solid waste to say that lead isn't condensed and exists in the gas phase above 600 °C in waste incinerators (calculated for the thermodynamic equilibrium conditions). Thus I'm uncertain about the minimum temperature for lead to condense or about whether the vapor pressure close to or above 1 atm is necessary for lead to condense on the surface of something in the WTC fire conditions or in the rubble pile. I understand any kind of fire-induced WTC collapse model is already (or rather from the begining) lame-duck, and this wouldn't generally be affected by the above argument at all, but I want to be properly confident in what I'm saying when I debate with some diehard proponents of the official story. inokane on Tue, 02/26/2008 - 2:00am. Bravo for softened steel and pancakes? Footnotes 1, 10, 11, and 14 are redundant, as are 2 & 5, 4 & 6, and 9 & 13. And, like all but 7, they refer to the 2001-2002 OCT fire/pancake theory. The only recent one  from 2007 (see below) still has Prof. Astaneh-Asl supporting fuel-fired structural collapses. [from news text] One piece Dr. Astaneh-Asl saw was a charred horizontal I-beam from 7 World Trade Center, a 47-story skyscraper that collapsed from fire eight hours after the attacks. The beam . . . had clearly endured searing temperatures. Parts of the flat top of the I, once five-eighths of an inch thick, had vaporized. "Less clear was whether the beam had been charred after the collapse, . . . or whether it had been engulfed in the fire that led to the building's collapse. . ."
[from news text]: A fluff piece spouting, "When terrorists rammed two airplanes into the towers, burning jet fuel gushed into the structures. The blaze heated and weakened their steel beams. Soon both towers collapsed like souffles," with Prof. Astaneh-Asl suggesting that, " the towers might have withstood the attack had they been reinforced properly with 6-inch-thick concrete-and-steel shear walls" [his new design theory]. "Steel flanges had been reduced from an inch thick to paper thin, Astaneh said. He and others suspect that the buildings collapsed because the intense heat of the jet-fuel-fed fire softened the steel to the point that the columns no longer could support the weight of the floors above. As the top 10 or so stories fell, they collapsed the floors below in a cascade of pancaking concrete floor slabs." Footnotes [4, 6] "He says the buildings might have survived the plane crashes if the ensuing jet-fuel fires had not weakened the upper floors and started a "pancaking collapse." Another plug for Prof. Astaneh-Asl's "disaster-safe building design", where he says the towers' structural columns, "withstood the original impact of the planes [and] remained structurally sound until the heat of flaming jet fuel reached 1,000 degrees Celsius and began to melt the steel. The softened columns could no longer support the floors above, and the entire structure began to collapse. Footnotes [9, 13] 3/12/2002 - Some good words about lack of WTC forensic investigation, but also, "the towers would very likely still be standing had the impact been the only damage. But when the planes penetrated the buildings, they injected tens of thousands of gallons of extremely flammable jet fuel into each tower." Then he goes on to push his new building design ideas followed by the official pancaking floors theory. Here Prof. Astaheh-Asl compares the gasoline-fired bridge collapse to the jet fuel 9/11 fires, saying "In both of them, basically, the fire was the reason why steel got soft and weak and collapsed." Lucid on Tue, 02/26/2008 - 4:41pm. Terrific research. Incisive and to the point. Bravo indeed! Tom Breidenbach on Mon, 02/25/2008 - 7:36pm. Despite his observations he has not challenged the official fire/gravity theory, so I would urge against including him on patriotsquestion911.com. He would however make an excellent target for A&E to approach, especially as he is in the bay area. I will recommend this to Richard. For factual accuracy, he was not on the ASCE team. His funding was through the National Science Foundation. This is all the more reason to be optimistic about approaching him, he doesn't have as much to hide. NationalInstitu... on Mon, 02/25/2008 - 7:45pm. corresponded with him (maybe 6 months ago). GeorgeWashington on Mon, 02/25/2008 - 7:58pm. on the outcome of your correspondence. GeorgeWashington on Tue, 02/26/2008 - 2:25am. AboveAverageAmerican on Mon, 02/25/2008 - 9:41pm. "Astaneh-Asl said that steel flanges "had been reduced from an inch thick to paper thin." "
"Parts of the flat top of the I, once five-eighths of an inch thick, had vaporized." "
wildbill on Tue, 02/26/2008 - 1:13am. Shoestring on Tue, 02/26/2008 - 2:19am. wildbill on Wed, 02/27/2008 - 11:49pm. disturbed, contaminated, dismantled with blow-torches and shipped to China. .
in fact there are some very interesting images with EXIF-data intact and in original quality on that site . If anybody knows of a source for images BEFORE the evidence-destruction started I would be very interested in a link or something . FEMA's gotta have a whole bunch of them but they don't seem to make anything prior to the "clean-up" available.. surprise, surprise ! Peter on Tue, 02/26/2008 - 5:45pm. has some of the best pictures I've been able to find and the best documentation. DoYouEverWonder on Tue, 02/26/2008 - 10:20pm.